After a couple Sunday mornings focused on what our church will look like on the weekend, we are back to Church Hopping! This week: Mountain View Church. We first heard about Mountain View when they sponsored a local "gas buy down" on a Saturday morning near our home. We've also heard they are working to raise money to purchase a vehicle for a single mom... gotta love it! Looks like another great church in Chattanooga! 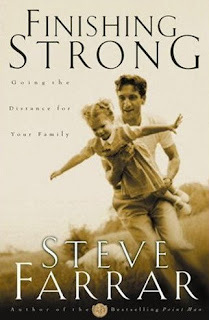 A few years ago, at the prompting of my mentor, I read a book entitled: Finishing Strong by Steve Farrar. In it, he makes the claim that only 1 in 10 who start out in full-time service to the Lord at twenty-one are still in by age sixty-five. Fortunately, I've tipped the odds in my favor by getting such a late start, but the statistic is quite startling. 1 in 10. The advice that comes out of the book can be summarized in its first chapter: "Stay true to Jesus! Make sure that you keep your heart close to Jesus every day. It's a long way from here to where you are going to go, and Satan's in no hurry to get you." To my team, to my spouse, to my son, to my Lord - I make this commitment: I will seek each day to abandon myself to His will, recognizing that I am on a marathon, not a sprint. I would ask you to do the same. Whether or not we are in "full-time" service via a paycheck, we are all called to His unending purposes which transcend a mere salary. And we choose to finish strong over being among the 9 in 10 who don't by making room for Jesus each day and keeping Him at the center of all we do! As we begin The Net, may we never become arrogant and believe we are doing anything special outside of His grace. May we never become so confident in our plans that we dismiss our ongoing need of His presence. We are headed into an exciting time - so take a deep breath and allow His spirit to fill your lungs, because the road ahead is long and full of adventure and without Him we will certainly fail! In 1964, physicist Peter Higgs theorized that an invisible field of bosons (particles that can occupy the same space) existed in a form that allowed it to make planets and people. The problem is, it's only showed its existence once... moments after the Big Bang! 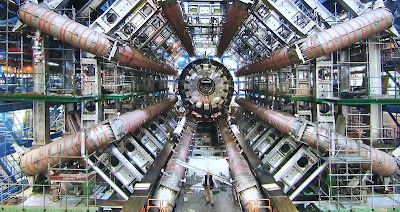 This brings us to today - introducing the Large Hadron Collider (LHC) - an $8 billion partical accelerator. It's purpose: to smash subatomic particles together at speeds of 99.9999991% of the speed of light. While scientists hope to make numerous discoveries from it, one main goal is to find the Higgs boson and simulate the Big Bang! For creationists, this would be the equivalent of building an $8 billion megaphone and voice modulator to simulate God's command in Genesis 1:3, "Let there be light!" in hopes of actually making it happen. Higgs said in a recent interview that if his boson is not found he will no longer understand what he thinks he understands. I wonder, if at that time, he'll begin to understand what we all understand - that God created life! When we were with Seacoast Church in South Carolina, they started a Dream Center - a place to meet the needs of the low-to-no income in the area. Today I came across an article about a couple in Chattanooga with a similar vision for the city. The couple's ministry (Grace in Action) is hoping to purchase a hotel to help house the homeless and become a "one-stop shopping center" for those in need. This weekend we are headed to another theater church in the area: Hamilton Life Church. Their pastor actually sent me an email a few weeks ago, welcoming us to Chattanooga. I'm eager to meet him and visit the church. The review was moderately critical - though not too harsh. We've seen and heard worse. And while I do appreciate the free publicity, I wouldn't want someone reading his response without offering a short riposte of my own. 1. Ty references statements from two of the videos on the website that deal with the church being relaxed and refreshing. He rebuts by saying that church isn't about you and I, it's about Jesus. He then goes on to say that at church we are to join in fellowship, exalt God above our struggles, and submit our lives to Him. I agree with all of that - and you know what I feel when I've had that experience in a church... you guessed it! Relaxed and Refreshed! 2. Next he voices concern over a line in one of the videos where a guy is seeking a church that is relevant to today. Ty calls this line of reasoning "a product of the modern Gospel". He defends that the gospel is relevant to all people at all times because we all sin. Again, I agree. However, unless we can explain the gospel to them in a way they understand and in concert with the Holy Spirit, they will not see their sinfulness and need for a Savior. Paul did this while in Athens (see Acts 17). He prayed for it in Ephesians 3:18. And Christ, Himself exemplified this model by using parables "relevant" to the people who listened to his teaching. Relevance is merely the modern day version of apologetics! 3. Ty concludes his blog entry by saying; "I hope that I am wrong. I so do. But this sounds like another attempt at a 'Seeker Sensitive' man-centered Gospel." Ty... if you are reading this, please know... we ARE sensitive to seekers and the only thing man-centered about our gospel is that Jesus Christ became one to save all! To read Ty's blog, click here. One of the blogs I follow is from a pastor in the Chicago area, Dave Ferguson. He posted an entry this week about a girl in his church who used her birthday as an opportunity to throw a party for the homeless. I guess I'm posting this because Chattanooga seems to have many homeless individuals and it has been a topic of late at some of our meetings. At any rate, the story is touching.